Rosa Grauman is not in the Internet Movie Database. She doesn't have a wikipedia page or a fan group on Facebook — and yet — she has her own square dedicated to her memory, placed there in the Forecourt to Grauman's Chinese Theatre by her loving son, Sidney Patrick Grauman. 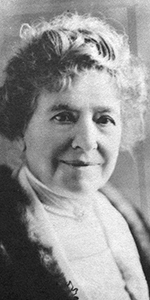 Born in obscure circumstances in 1853, Rosa married David J. Grauman, with whom she had six children. Sidney Patrick Grauman was born on March 17, 1879 in Indianapolis, Indiana, when Rosa was 26. The family history is vague, but David had an interested in mining. When Sid was fourteen, the family was in Colorado. Sid was invited to attend a fancy party at the home of a well-to-do family. Sid was in a panic for the lack of suitable clothes to wear. Rosa found one of David's cast-off suits, then created a new suit for him to wear. It was at this party that Sid discovered his flair for arranging amusements. Later, Sid and father David took off for the Yukon Territory to get in on the Gold Rush there. They did not find gold, but they quicky arranged entertainments of all sorts — selling newspapers, boxing matches, and films. The family was in San Francisco by 1900. The Grauman's opened the Unique Theatre, adding films to their vaudeville lineup. A second theatre was opened, called the Lyceum. The Grauman's became operators of an agency for vaudeville performers throughout the Pacific Northwest. The family lost their interest in the San Francisco theatres — just in time for the 1906 earthquake there — Sid salvaged a projector and some films, and set up a tent to show films in. The show must go on. Enough money came in to allow the Grauman's to control other theatres. By 1917 however, they all decided that they would sell their San Francisco assets and move to Los Angeles. Adolph Zukor bought the Grauman theatres, and helped them finance their first house in Los Angeles: Grauman's Theatre (also known as The Million Dollar Theatre, due to its supposed construction cost). The Rialto Theatre was added to the mix in 1919. When Rosa's husband David passed away suddenly on April 6, 1921, Rosa took a suite adjoining Sid's at the Ambassador Hotel, where they lived in spendid harmony together as Sid opened his Egyptian Theatre in October, 1922. Grauman's Metropolitan Theatre (later to become the Paramount) followed in January, 1923, and, as we know, the Chinese in 1927. Rosa was a musician. She could play piano and organ, as well as the violin. She composed also, playing her Valse Brilliante over radio station KFWB in June, 1933. The orchestra on this occasion was conducted by sometime Grauman's Chinese conductor, George Stoll (who would earn everlasting fame as Associate Conductor for The Wizard of Oz in 1939, and which had its west coast premiere at the Chinese in August, 1939). Stuart Brady, who had a solo in the Prologue forthe first film to played the Chinese in May, 1927, King of Kings, tells of how, shortly after the theatre had opened, Sid had taken Rosa to the theatre before a matinee, led her to the Wurlitzer organ console, and sat in a seat while Rosa performed an impromptu medley of well-known organ pieces by Bach and others. Sid was never so happy. Rosa contributed to local charities, and, like Sid, she was held in great esteem by the film folk. When she died in June, 1936, she bequeathed $200,000 to her son Sidney, who kept all of her possessions, refusing to part with any of them. In 1940, Sid Grauman decided to posthumously add Rosa to the Forecourt, and people asked him why, since she was not a movie star. His response: "She was always a star to me." Actor George Raft was imprinted that evening, which insured that a good crowd would turn up. 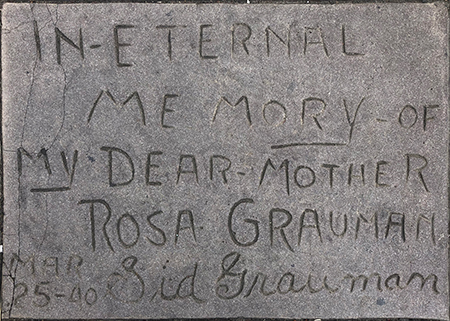 The Rosa Grauman block is inscribed by Sid Grauman. Just before he himself passed away in March, 1950, Sid Grauman said of Rosa in an interview: "We were great pals, my mother and I. Greater, I suppose, because I had never married, and because we had only each other for a good many years."